Pirates of the Caribbean has the distinction of being one of the few active rides Walt Disney had input on before he died. According to Disney developer Jason Surrell, who wrote the book Pirates of the Caribbean: From the Magic Kingdom to the Movies, Walt initially envisioned the Pirates attraction as a walkthrough narrated by a tour guide, with wax figures of famous pirates. But ride technology improved so much by 1963 that, after the success of the It’s A Small World boat ride at the New York World’s Fair, Walt decided that a proper ride, with real boats and real water, would be the best. This sketch eventually became an iconic part of the Pirates of the Caribbean ride, seen below. This ride scene would eventually feature in the first Pirates of the Caribbean film, The Curse of the Black Pearl. According to Surrell, Davis originally intended to portray pirates realistically, with depictions of famous pirates of the Golden Age. The more Davis researched, however, the more he realized that real pirates were much less glamorous than he had anticipated. Pirates rarely battled at sea. They were as likely to die from a venereal disease as from a rapier wound. So Davis pivoted to the more whimsical, romanticized approach that audiences enjoy today. The pirates have a caricatured, rounded appearance that makes them softer and less threatening to a young audience. Before riders see these pirates, though, they’re treated to wordless scenery. Like The Haunted Mansion, Pirates of the Caribbean opens with evocative visual imagery: a series of tableaus featuring pirate skeletons, locked eternally into the moments of their demises. This still life tells a clear story: Money corrupts. There is no honor among thieves. The scenery speaks for itself; we don’t need to be spoon-fed the story. It isn’t the story of any one pirate, either. Together, these skeletons paint a rich picture of the pitfalls of useless greed. A skeleton sits perched on top of a mountain of treasure. A skeleton is tucked into a lavish bed, surrounded by decadence. Despite their riches, mostly unspent, these pirates ended up the same way—as dead as everyone else. Some of the skeletons move, implying that they are damned men, cursed with repeating their life’s actions through the eons. Like this skeleton, who guzzles red wine into his non-existent belly. It was a brief respite of humor, despite the overall eeriness of the presentation. Then, the guests’ boat slid down a slight incline, and guests went further back in time to when these skeleton pirates had flesh on their bones. Until 2006, Pirates of the Caribbean wasn’t a narrative ride like Splash Mountain, which told a cohesive, sequential tale of Br’er Rabbit and his beloved Briar Patch. Instead, guests floated through a coastal town as it was being invaded. It was an immersive experience of what it was like to be a pirate, rather than a linear, A to B story. Visitors didn’t see a pirate in one scene, and then see the same pirate in another scene, advancing his plot. Instead, they saw all manner of pirates, doing all manner of things, in different parts of the town. Since no one pirate was the focus, all the pirates were the focus. The audience members had their heads on swivels, trying to take in every last detail. No one ride was exactly the same for any two audience members. But in 2006, Disney announced they were adding Captain Jack Sparrow to the ride. He had become so identifiable with the Pirates of the Caribbean brand that it seemed inevitable. 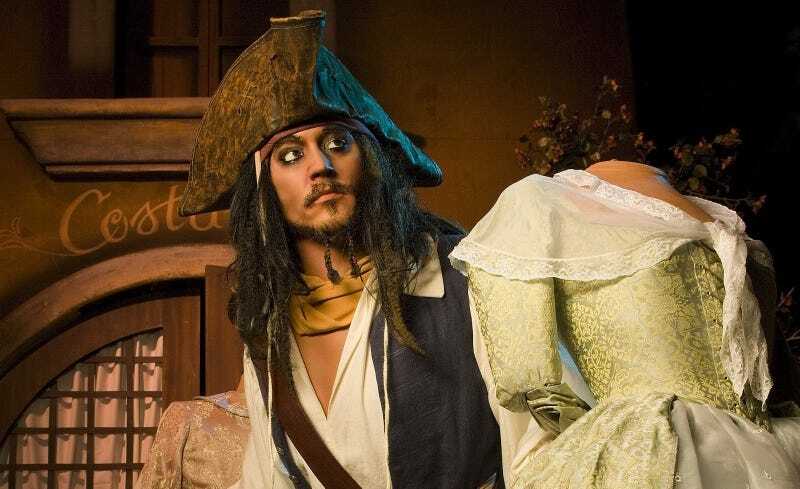 The Jack Sparrow robot (Disney calls them “Audio-Animatronics”) looks uncannily like Johnny Depp. He stands out from the cartoonish pirates that surround him. A caricature of Depp in Davis’ style would have blended in, and that was not what Disney wanted from this change. While the initial skeleton tableaus were left untouched, Disney overhauled the town scenes to fit Sparrow in. Sparrow, unlike any other pirate, appears three times. First, he appears at the well-dunking scene, peering out from behind some mannequins. Later, he hides in a barrel and peeks at a treasure map another pirate is holding. And finally, he lounges in a chair at the end of the ride, celebrating with his new treasure. In Walt Disney World, Sparrow actually replaces the original, drunken pirates in this final scene. Together, these multiple appearances turn the ride into a version of Where’s Waldo? as far as riders are concerned. The last time I rode Walt Disney World’s Pirates of the Caribbean was in 2012. I was chaperoning a class trip for my students, and so I was sitting in the back of the boat. Every time Sparrow made an appearance, my kids would point and stare, neglecting everything but the celebrity they recognized. Sparrow appears twice in large crowd scenes, where the audience will miss out on numerous wonderful details if they just zero in on spotting him. By adding him into the ride in this way, the entire experience of Pirates of the Caribbean has changed. The experience becomes less exploratory of the little side-narratives and more directed towards A Big Plot. Fire at will! Stand by at your guns, mates! Strike your colors, ya bloomin’ cockroaches! By thunder, we’ll see ya to Davy Jones! Surrender, ya lily livered lubbers! Strike your colors, ya bloomin’ cockroaches! Surrender Cap’n Jack Sparrow—or, by thunder, we’ll burn this city to the ground! It’s Cap’n Jack Sparrow we’re after—and a fortune in gold. Put up your white flag, ya scurvy scum. Bring me Cap’n Jack Sparrow, or I’ll be sendin’ ya to Davy Jones! This is no longer Pirates of the Caribbean. This is Pirates of the Caribbean: The Search For Captain Jack. This new, linear narrative about Jack Sparrow trying to beat his fellow pirates to some treasure is far less interesting than the vague non-narrative that it replaced. Nothing is left to the imagination. The fanciful pirates and their adventures become the backdrop to Jack Sparrow. The audience is so honed in on a single pirate that they’re likely to miss the hundreds of other things going on throughout the ride. Every new guest now leaves the ride with a similar story to every other guest—how Jack Sparrow got the treasure—rather than a unique experience of pirates. And that’s a shame. The current attempt at fixing the scene has some of the women chasing after the men, who are carrying looted jewelry and other goodies. This type of revision appeals to changing social norms. Pirates of the Caribbean has benefitted from updates like these, as well as changes to its lighting, sound, and technology. But these sorts of changes do not alter the ride’s overall purpose, or change the way the guest is meant to interact with it. ‘The Search For Captain Jack’ does. Disney has also shown this tendency in the Pirates of the Caribbean films.The first film, The Curse of the Black Pearl, made Jack Sparrow a supporting character. But the scenery-chewing Sparrow was so well-received and beloved (Depp actually scored an Oscar nomination for his performance) that he became the protagonist in three subsequent films: Dead Man’s Chest, At World’s End, and On Stranger Tides. It was important to go back to the same dynamic that the first film had where Jack is not the main character. I wanted a story about real people, real characters - and then Jack Sparrow comes in and crashes the party every now and then. The movie franchise was inspired by the ride. And now, fittingly, the ride need to take a lesson in restraint from the films. Pirates of the Caribbean’s recent changes shrink the original ride’s expansive experience, stifling the imagination rather than inspiring it. The ride is at its best when guests can dream up their own stories, instead of having one imposed upon them.